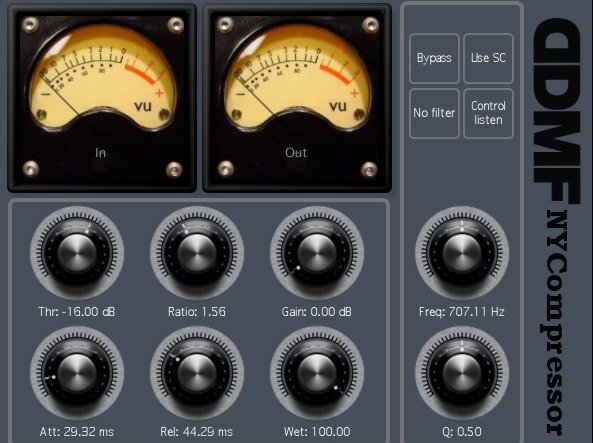 NYCompressor, Software compressor from DDMF. DDMF has released an update of NYCompressor to version 2.0. 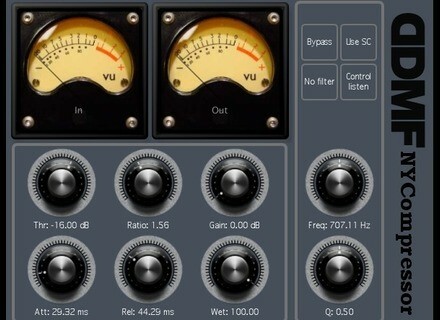 The plug-in has been restructured to allow for independent Left/Right or Mid/Side compression on stereo tracks. With a button, the GUI size can be doubled and the second instance loaded. Backwards compatibility with projects using the 1.x version is assured. NYCompressor is now also available for Windows 64-bit. This update is offered to existing users of the 1.x version for a 50% reduction (i.e. $10 instead of $20). Windows 64-bit versions of IIEQPro, LP10, ColourEQ, NoLimits and StereooeretS are also now available (only Metaplugin has to wait). The x64 versions of these effects are available for all existing users free of charge.